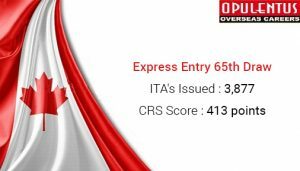 The new Express Entry which took place on May 31st has yet again witnessed low scores in CRS- comprehensive ranking score of 413 or above and issuing an ITA to all such applicants. These CRS scores were set for the FSWC-Federal Skilled Working Class and the Canadian Experience Class (CEC) under the Express Entry Program. The Earlier draw had taken into account the FSTC and PNP nominations which also saw plunging scores.The Express entry since its inception date of January 1, 2015. There will be many new changes due to happen in the coming weeks which will be more exciting for the applicant’s journey through the road of Express Entry.THE IRCC has dynamically changed multiple set-ups regarding the scores which have been the main factors for movement of an immigrant to Canada and its related Province. This year 47,876 ITA’s have been issued, and it’s going well to add more no.s to the same.